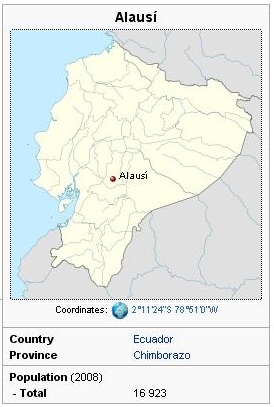 Alausi is a town in the Chimborazo province of Ecuador. Colonial Alausi During the Spanish conquest of Ecuador, the city was named by Benálcazar as San Pedro de Alausi, giving the city the name of the Saint of the Day, coinciding with the founding of the city of Quito. Later the founding of the city was legalised by Benálcazar with the name "Alausi". After the creation of the Government of Quito, Alausi formed part of that province as a lesser political and administrative entity. In 1780, when Quito launched its movement for independence, Alausi recognized the new government and named Captain Jose Antonio Ponton as its voice and member of the Junta. When the first assembly of the free towns took place in 1811, Captain José Antonio Pontón served as Representative for the Province of Alausi, in which capacity he signed the Carta de Estado de Quito in 1812. This engineering work is among the most audacious projects realised in the Andean mountain range. Its zig-zagging trajectory seems to make every moment feel like imminent danger. Nariz del Diablo was the tomb of many Jamaican slaves contracted to dynamite the mountain. Alausi is known for its fantastic architecture, and most of its houses are more than 100 years old. Together with its churches, streets, and monuments, the city is worth visiting and admiring. In Alausi, one finds various monuments located in the parks and important places in the city. Without doubt the most important is the Monument to Saint Peter (Monumento a San Pedro), the patron saint of the city. This monument is located in Loma de Lluglli, and can be seen from any point in the city due to its large size and strategic location. Churches are a tourist destination in most Ecuadorian cities, and Alausi is no exception. The most important church in the city is "la Matriz", located in front of 13 November park (parque 13 de Noviembre). The church was constructed in the 18th Century with stone extracted from the mines of Chiripungo, located about 2 kilometers outside of the city. Carnaval is the traditional festival of Alausí, and is celebrated with a special parade, in which the neighborhoods of the city and special invitees participate. The running of the bulls and other festivals are also celebrated here. A testament to the Spanish influence in South America, the Festival of San Pedro is celebrated from June 22 - July 2, and has been celebrated since the colonial era. Traditional dance, music, folklore, cockfights, bullfights and other activities attract Ecuadorians and international tourists to the celebration. This page was retrieved and condensed from (http://en.wikipedia.org/wiki/Alausi) see Wikipedia, the free encyclopedia, May 2009. Hui Chin and I visited Alausi again during 2009 and here are some more pictures for you to look at.